Black bears actually go through 5 stages of activity levels throughout the year – hibernation, walking hibernation, normal activity, hyperphagia, and fall transition. During fall transition, much like fish and other animals, the bears eat excessively to bulk up for the coming winter. At the end of this period, they actually stop eating, even before hibernation begins, and focus on drinking liquids to expel waste. They begin sleeping more and more, sometimes only awakening and moving around for 3-4 hours a day. Actual hibernation periods can vary greatly, depending on the weather and region where the black bear lives. In Wisconsin, hibernation can begin as early as September and last through April. The preparation, though, begins in the summer months when the bear chooses a spot and begins digging a den. But black bears tend to wait for one of those Wisconsin size snowstorms to actually retreat to their sanctuary. As the bear retreats to its den, it begins to enter a period of deep sleep. The heart rate, body temperatures, respiration levels and metabolic rate all begin to slow. Did you know a hibernating bear only breathes once every 45 seconds? The body temperature goes down by about 10 degrees, which is significantly less than that of other hibernating mammals. Another difference for black bears is that they CAN be awakened fairly easily during their deep sleep – hence the saying “don’t poke a sleeping bear!” At 400 pounds, a Wisconsin black bear is not a creature you want to bother! Another interesting fact about black bears during the winter is the birth of their cubs. Female black bears can actually delay implantation until late fall to determine if she has enough fat reserves to successfully birth and nurse her young. The actual birth takes place in the den, typically in January. As the mother slumbers, the little cubs nurse and grow quickly beside her, ready to leave the den with her in the spring. Black bears get to enjoy all the comfort of holing up for the winter, but unlike humans, they don’t have the added pounds to show for it come spring. In fact, despite the fact that black bears do not eat for long periods of time, they emerge in the spring healthy and healed from their rest. Now, if you were to eat very little all winter to scare off those few pounds, your muscle mass would be deteriorated and you would be starving. And likely pretty grumpy! The applications that nature presents for human health are fascinating! We have long relied on medicines and cures from the world’s plant and animal life, and the possibilities continue to expand every year. Next time you chance upon a lumbering black bear, or are enjoying the beauty of the forest foliage, think about the miracles that nature presents, the intertwining threads connecting man to wilderness, the sheer bigness of the world in all of its magic. Because simply by taking a moment to breathe in that beauty, you have begun a wonderful journey! And the next time you are sipping a delicious steaming cup of hot cocoa, make a toast to the sleeping black bear that is dreaming of such a treat! Connect with Nature at The Wilderness Reserve of Wisconsin! Forming a lifelong connection with nature can be one of the most rewarding journeys of your life. Introducing a child to that wonder and awe is even more satisfying. By planning a family vacation to The Wilderness Reserve, you can experience Wisconsin wilderness up close and personal! Enjoy your choice of outdoor activities on this 5,500 acre reserve, where the trees stand tall and the views can take your breath away. Can you imagine a better setting for a Wisconsin family vacation? We can’t! Book your Family Vacation at The Wilderness Reserve Today! Summer has passed, and the beautiful season of autumn is upon us. This is the perfect time of year to appreciate the natural beauty of the forest around you and instill a deep connection with nature in our youth. But do you know why the leaves change color in the fall to give us such a stunning landscape portrait? And how do you make the most of the season? Throughout the summer, the forest trees soak in the sunlight and the rain to maintain their healthy green coloring. When autumn comes, a complicated process involving the leaf pigments, the amount of daylight hours and weather conditions takes place to create the vivid hues we all love so much. As the color pigments in the leaves change, depending on the environmental factors, the forest comes to life with fiery oranges, yellows, and reds. Three different pigments come into play for the popular autumn color change in the Midwest. Carotenoids, anthocyanin and chlorophyll are the color pigments. As the amount of sunlight goes down, the trees respond by producing less chlorophyll, the green pigment that dominates in the summer. Then the carotenoids step up to bring in the orange and yellow fall colorings. You may think that the reds are brighter one year than the last, and you are right. The carotenoid pigments are present in all leaves, and the yellows, golds and oranges are fairly consistent from one year to the next. But the red coloring is produced by anthocyanin, which doesn’t exist in all trees and needs just the right conditions to shine bright. What are the best conditions for a spectacular autumn season? Warm and sunny days with cool evenings that are above freezing are best. This is because these conditions create more sugars, which lead to brighter colors. A hot and dry season lowers the color intensity because the soil moisture level is lessened by the heat. Even climate factors in the spring can affect the fall color season – a late spring or early summer drought can delay the color change. Looking at the forest as a whole, most people don’t consider the individual trees that make up the view. In fact, it’s only because of the wonderful diversity of trees in the Midwest that the fall colors are so stunning. Each type of tree has its own hue, and, as discussed above, can be different every year so no two autumn forests are the same. Oaks – reds and brown leaves. These are some of the last to change colors. Sugar maples – orange red leaves. Red maples – bright scarlet red leaves. Beech – light tan leaves. Aspen & poplars – golden yellow leaves. Black maple – bright yellow leaves. Study up on the different types of trees in the area, and then put that knowledge to work with some educational outdoor activities! Go traditional by jumping into a big pile of raked up leaves together. Have a day of apples – taste test apples from different trees and pick from your favorite to make an apple pie. Take a hike through the forest, identifying types of trees from memory or a guide book. Have a leaf scavenger hunt by trying to collect fallen leaves from as many different types of trees as possible. Throw in some pine needles and fall ferns for an even better learning experience. Take the collected leaves and make a scrapbook for the day, complete with drawings and photos from your outing. Make an autumn leaf collage by pasting different colored leaves on a hand drawn tree. Do some leaf sketching by placing paper over a leaf and rolling a pencil across. Study together how the leaves are broken down once they fall to the ground, and discuss why this process is important. Go for a boat ride to admire the colors from the water, and try your hand at some fantastic fall fishing. Visit a local farm to pick corn on the cob, or explore a corn maze. Get sporty with pumpkin bowling – set up some short, fairly light logs as pins and roll the pumpkin for a strike. Go on a color scavenger hunt – set out with a chosen color and find all the things in the forest of that color. What are your favorite fall activities and traditions? We would love to hear from you! Share your fall inspirations with The Wilderness Reserve on Facebook! Plan Your Wilderness Family Vacation in the Midwest! What better way to strengthen your family bonds than a wilderness family vacation? No matter the season, your family will enjoy the inspiring beauty of nature at The Wilderness Reserve. Secluded cabins offer the perfect base to explore the surrounding forests and lakes on the 5,500 acre reserve. Ready to book your wilderness family vacation at this convenient Midwest destination? Call us today at 715-545-2700! Book Your Trip to The Wilderness Reserve Today! Nothing beats the warmth and comfort of sitting around a campfire at dusk, as the wilderness behind you slowly disappears and the flames bring a gentle and flickering light to the darkness. Whether you are enjoying this outdoor tradition with your closest friends or your dear family, the experience is sure to ignite childhood memories, warming you from the inside out. Where better to ponder the meaning of life or share old stories than around a campfire in the beautiful Northwoods? And where else to enjoy a meal filled with smoky goodness and unbeatable flavor? Campfire cooking can be fun for all ages, and offers a lot more variety than your standard hot dogs and marshmallows. Why, you may be asking, would we be talking about campfire cooking on The Wilderness Blog? Sure, the cabins at The Wilderness have kitchens equipped with all the cookware and dishes you need. But why not enjoy a campfire meal to make the most out of your wilderness vacation? For that matter, use these tips right at home, in your own backyard, to bring a tiny bit of the wild into everyday life! Campfires are not all created equally, and when you are going to cook, it’s all about the coals! A proper campfire starts with selecting the right type of wood – stay away from green wood in favor of nice, dry hardwoods that will burn better. The trick is to build up the fire slowly, adding a log at a time, while brushing the coals to one side. Once you have a white hot bed of coals about 2 inches thick, it’s time to cook! Traditional campfire cooking requires the chef to venture out into the forest to find just the right branch for a cooking stick. If it’s too thin, you risk dropping your treats in the fire and too thick means a gaping hole in your dinner. Whittle the end of the chosen branch to a point, and get rid of any twigs or leaves. Make sure your stick is long enough that you aren’t risking burns, but not too long that you lose control of the exact placement over the fire of the food. 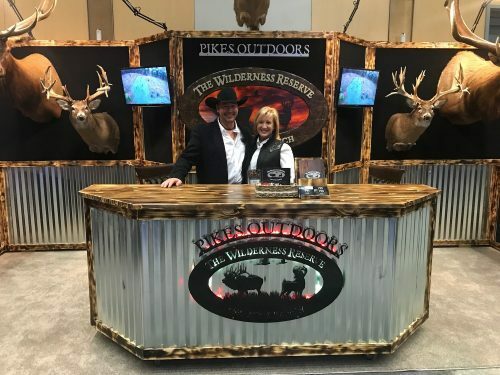 Or you can choose to go the city slicker way and buy a metal cooking stick – we strongly recommend wood for the best flavor and true sportsman bragging rights! S’mores: Everyone loves a gooey marshmallow! But if you don’t know how to make a s’more, well, you probably shouldn’t be the campfire chef! Hot dogs: ditto the above, there’s really no wrong way to do this unless you attempt to cook without the stick! Pig on a stick: tasty upgrade to the hot dog; wrap a cooked sausage link in Pillsbury breadstick dough, place on the stick, and roast until the bread turns golden brown. Kabobs: Fan favorite kabobs can be made with almost any meat and the vegetables of your choosing. Try cubed steak, pork, chicken or shrimp and mix with mushrooms, onions, peppers, cherry tomatoes, and potatoes. This easy roaster allows everyone to create their own to their personal liking. Pair with corn on the cob for a finger licking, no fork needed dinner. Wrapping your meals in tin foil allow you to place them right on the coals and capture the smoky flavor to the fullest. Pay attention to the tips for building your campfire discussed above, because you can’t just toss your food into the flames and hope it turns out edible. For any foil wrap campfire cooking, be sure to flip the packet over a few times and check doneness before eating. Double wrap is always best if you aren’t using a really sturdy foil. And wrapping in a way that leaves a little tinfoil ‘handle’ makes for easier control. Campfire baked potatoes: Please refer to Stick Campfire Cooking #1, above. All-in-one campfire dinner: Make this wrapped dinner with ground beef or your choice of chopped meat. Simply dice up your favorite vegetables and place in the foil wrap with the meat. Top with seasonings and a sauce of your choosing (try butter, ketchup, BBQ sauce or even lemon juice), close the foil and toss on the coals. Cook time should be about 30 minutes. Bacon Wrapped Baked Fish: Clean and butterfly your fish and season with garlic, sage and pepper. Fold the fillet around sliced onion for moistness and flavor and wrap with bacon. Cover the fillet with foil and cook on campfire coals for roughly 20 minutes. Campfire Breakfast: Place a hash brown patty or thinly sliced potatoes on the foil. Make sure your packet is crimped upwards, and pour a slightly beaten egg in. Top with sausage patties or bacon, close the wrap, and cook. If you are a cheese lover, try adding a slice when the other ingredients are close to done. Campfire Muffins: Who knew you could make bakery on a campfire? Cut an orange in half, and scoop out the fruit (bonus, serve finished dish with sliced orange). Pour muffin mix into the peel, carefully push halves together and wrap with foil. Cook 10-15 minutes on the coals, and you have fresh, great smelling muffins! Try this with cake batter for campfire cupcakes! Did you know that you can wrap your chicken or filet in cabbage or lettuce leaves to cook directly on campfire coals, without foil? Extra flavor, extra moistness, extra easy! Discover Northwoods Nature at The Wilderness Reserve! When you book your family vacation at The Wilderness Reserve, you don’t just get a place to stay. You get a unique opportunity to enjoy all that nature and the great outdoors has to offer. Take a wilderness hike, try your luck fishing on your cabin’s private lake, and enjoy the timeless tradition of a campfire! Stretch each outdoor moment to the fullest! Ready to schedule your Northwoods family vacation at The Wilderness? Contact us today! Do you have a favorite campfire recipe? Share it with The Wilderness on Facebook!